Gravity and Renee: Ideas to Get Better Student Talk! 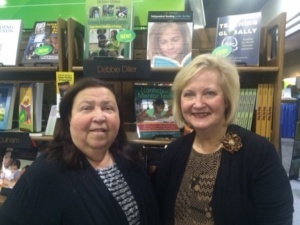 CARR’s Spring 2017 guest presenter, Gravity Goldberg, joins forces with co-author of “What Do I Teach Readers Tomorrow?”, Renee Houser, to share strategies with us for how to move “beyond blank stares”. Check out this post from their blog- and watch the video, too- you’ll be glad you did. How Does an Idea Become a Best Practice? I recently participated in an Instructional Coaching workshop hosted by CREC. Part of the learning was developing reflective practices to improve instruction and ultimately student learning. One method to accomplish this was using video to help teachers focus on goals for instruction and student learning. There was one excellent training video that could be used by teachers to reflect on their own practices, by coaches to foster conversations with colleagues, or by mentors who are training new teachers. It is titled Using Video to Improve Practice: Do It Yourself! and features Sarah Brown Wessling. Like a message in a bottle that first crashed on to shore on a wave of reforms – only to be carried out and back in again by smaller waves and currents – teacher evaluation has come, transformed, and settled into the everyday lives of teachers across Connecticut. For those who were involved in the pilot year, this marks the third year under the new policy, which has rolled back in intensity each year since the start. For others, this is the second time around: A chance to consider evaluation more closely and to begin to find ways to use it to support teaching and learning. As I study teacher evaluation and teach reading specialists, I have heard a wide range of responses to the new policy: from teachers who claim new rubrics don’t leave room for instruction they believe in, to those who have found new ways to engage and support struggling readers as a result of conversations with evaluators and colleagues. The truth is that teacher evaluation policies and rubrics for observation say very little about the nature of reading instruction that qualifies as exemplary. In this article, I am going to argue that this is good news for literacy professionals. The vague descriptions of “good teaching” in rubrics for evaluation and the room for personalization in individual teachers’ goals and measures of student growth leave us room to direct our efforts and evaluators’ attention to what matters the most in literacy classrooms. Focus on what matters most Reading is the most researched K-12 content area in all of education research. Despite its importance and complexity, decades of research and experience teaching reading tend to converge on the same set of opportunities needed to develop literacy. Teachers can arrange these opportunities within most any framework using literally any set of materials (Taylor, Pressley & Pearson, 2000; Bond & Dykstra, 1967), but without any one of these opportunities, we know literacy development is thwarted. One way to conceptualize these research-based opportunities to develop literacy is as non-negotiables (Gabriel, 2013) that must be part of instruction for every reader every day (Allington & Gabriel, 2012). The four non-negotiables are listed below. perspectives, with so many different goals. When we organize our instruction, professional conversations and goal setting around these non-negotiables, we can use teacher evaluation to focus our work on what matters the most. In the following section, I will briefly describe each nonnegotiable and what it means in the context of classroom observations, goalsetting and professional growth conversations. We know that time spent reading is necessary-but-not-sufficient for reading growth. It is not sufficient because simply putting in the time does not guarantee optimum (not too much or too little) exposure to new words and text structures, or the engagement and feelings of success required to motivate and sustain reading practice within and outside of school. Students must have high-success experiences with texts in order to solidify skills, build confidence, and leave room for the engagement that fuels comprehension and the motivation to continue reading. When students self-select texts, it dramatically increases the chances that they will find something they can and want to read. Ensuring every reader has something they can and want to read can be accomplished in a number of ways, but is antithetical to a classroom where every student is always reading the same class text with no alternative. This is not to say that shared reading experiences are not valuable for discussion and that challenge is never a good idea. A balance between shared and individual texts allows the best of both to contribute to literacy development. In fact, English teacher and author Kelly Gallagher would argue for a 50:50 split between whole class novels and independent reading (Gallagher, 2010). For classrooms with many struggling and/or reluctant readers, I encourage teachers to invest even more than 50% of their time doing the independent reading that fuels a cycle of reading success (Gabriel, 2013), and less on the shared texts that fail to match readers by level or interest. When an evaluator enters an effective literacy classroom, they should see evidence that students sometimes have the opportunity to read something they have chosen at or near their individual level. They should witness students actually reading at some point in a full period, and they should be able to interview students who will describe what they’re reading now and what they will read next. These indicators suggest that the teacher has invested in high-success reading experiences and organized instruction that promotes reading motivation, engagement and success. We know that reading and writing are reciprocal processes, which means that growth in either supports the other (Graham & Hebert, 2010). In fact, sometimes writing is a way into engagement with reading (Calkins, 1994), especially for students who struggle to learn to read (Dostal & Wolbers, 2014). Like time spent reading, simply investing more minutes writing is not enough. Students need to be writing to an audience, for a purpose, in order for writing instruction to be meaningful. Like reading for a purpose, writing for a purpose increases engagement and stamina, but it also provides an authentic reason to pay attention to conventions and skill work (e.g., spelling, punctuation, grammar, style) in context. Marie Clay famously referred to reading as “a meaning-making, message-getting process,” (Clay, 1991), but too often, writing is either avoided altogether, or taught and practiced without attention to its meaning or message. That is, students are taught to write formulaic paragraphs, brief responses, and journal entries that are only ever seen by their teachers. In other words, they write, but are not taught writing as an agentic linguistic process of composition (Kiuhara et al., 2009). Moreover, they are writing in formats that do not have any real referent in the outside world, and therefore fail to transfer to meaningful writing tasks. When students are asked to write in class, they must be writing to someone for some reason. Rather than writing a paragraph that a teacher will grade, students can write to their classmates, students in other grades, or school papers. They can create copy for a class website, a how-to book, a warning sign, a petition, set of directions or menu of options. Evaluators should see students’ writing to an audience for a purpose that they can articulate at some point during every class. Even if the writing is short and informal, without an audience and a purpose writing tasks cannot add up to meaningful practice. Audiences give young writers a reason to internalize conventions in order to ensure clear communication. Writing for a purpose gives young writers a way to make choices about structure and formatting in order to create a text that can accomplish something in the world. Investing in instruction and assessment that include writing to an audience, for a purpose ensures opportunities for students to develop both as readers and writers. Teachers are often unwilling to allow time for students to talk because they are afraid of what they will talk about, and assume time spent talking is wasted time. Perhaps this is the reason that students have so little practice or opportunity to engage in literate talk. Classrooms that support discussion and provide time and reasons to talk about text show significantly higher achievement, engagement and participation than classrooms where teachers do all of the talking, or only involve students in echoing or filling-in-the-blank of predetermined answers (see Nystrand, 2006 for a review). Evaluators should expect to witness students talking with each other about text in every classroom, every day. The old idea that a quiet and compliant classroom is a high quality classroom has been thoroughly debunked by the research. Students need to use language to learn language. They need conversations as reasons for reading and writing, and spaces for considering what they’ve been reading and writing. This talk about text means that students must have experiences with texts worth talking about and shared experiences making sense of texts they have written or read. We know that access to experts’ reading processes and strategies is invaluable for developing readers. This is especially true when reading in content areas where discipline-specific texts present unique challenges for readers such as unfamiliar formats, sentence structures, purposes for reading, and multiple meaning words (Fang & Coatam, 2008; Moje, 2008; Shannahan & Shannahan, 2008). Reading, like other complex and invisible multipart processes (swimming, driving, riding a bike) requires modeling – not of the outcomes of reading, but the very moment-tomoment thinking that leads to reading with understanding. Even (and especially!) in the upper grades, time spent reading aloud to students increases exposure, engagement and expertise when reading discipline-specific texts for discipline-specific purposes. Though students may have had the benefit of years of stories being read aloud in school or at home, few have been able to watch an expert approach the kinds of texts students use in math, science, theater or agriculture classes. As a secondary teacher, you may be their first and best model for meaningmaking in your discipline. Evaluators should expect to witness teachers talking about their thinking in every classroom every day. Students should be able to articulate how they approach, make sense of and fix their understanding of texts that represent the range of types and purposes required for the discipline. This means that a look around the classroom should show a range of text types, as well as some evidence or reminders of conversations about how they are read. Under new teacher evaluation policies, rubrics for observation and student learning objectives (SLO’s) define what counts as good teaching, and what evaluators should focus on during feedback and coaching conversations. Thus, rubrics for observation and guidelines for writing SLO’s are general enough to apply to every grade level and subject area. They therefore say very little about what kind of literacy instruction should count as good teaching, or what administrators should pay most attention to when observing and supporting literacy instruction. As literacy professionals, we have a responsibility to be able to articulate exactly how the general descriptors of rubrics, and criteria for goals apply to our visions of excellent literacy instruction. For example, Table 1 includes descriptions from the “exemplary” column of Connecticut’s Rubric for Effective Teaching third domain (instruction) next to descriptions of what this might translate to in a literacy lesson. Students are encouraged to explain how the learning is situated within the broader learning context/curriculum. Students are writing to a real audience, and will deliver their written products to that audience.Students are reading in order to do something: act, build, create, write, communicate, and are thus responsible for selecting texts that matter to them. 2. Writes something to an audience for a purpose. Invites students to explain the content to their classmates. Students talk about texts they have written and read, their conversations allow opportunities to use vocabulary in context, evaluate each other’s writing, and review/recommend books to one another. 3. Talks about what they read or write with peers. Challenges students to extend their learning beyond the lesson expectations and make cross-curricular connections. Students self-select texts so that they are applying skills and strategies learned in class to novel texts. Similarly, students compose written texts for specific audiences and purposes, this ensures their writing takes on the formats and conventions of authentic texts and are used as communication outside of the lesson. 1. Reads something they can and want to read. Provides opportunities for students to independently select literacy strategies that support their learning. Students have access to a wide range of explicitly modeled reading and writing approaches that match varied text types and purposes. These models allow them to use these flexibly for their own reading and writing purposes. 4. Listens to an expert reader read and think aloud. We have to be ready to articulate literacy-specific versions of good teaching with evaluators so that we can keep observations, feedback and conversations focused on literacy instruction. Similarly, we have to be ready to suggest goals and measures that mirror our visions of literacy instruction so that SLOs and IAGD’s do not promote a limited version of reading. Table 2 includes sample SLO’s from the state’s website (www.connecticutseed.org) along with the versions of reading they imply, as well as some alternatives. Students will increase fluency of reading with specific skill level, i.e. single word, within a story, etc. to improve reading comprehension. First graders will increase Nonsense Word Fluency score by 20 words and Second Graders will increase Oral Reading fluency by 45 words per minute, as assessed by relevant measures on the DIBELS assessments. Measuring fluency using nonsense words narrows the task to rapid word calling, rather than reading quickly and smoothly with expression in ways that promote comprehension. Students will write arguments to support claims with clear reasons and relevant evidence, including the acknowledgement of opposing claims, references to credible sources, a concluding statement, and a formal style. The majority of my students will be able to write arguments in response to literary and informational texts that score between Proficient and Advanced on the department’s rubric. Measuring writing using a school rubric may narrow the task to academic essay writing, rather than allowing students to select and compose in the format and style that matches their chosen audience and purpose. Fully-developed essays, graded analytically using the district rubric will improve by 10% by the end of the year. Measuring growth in writing in terms of the CCSS writ large would require a multitude of writing samples. It’s impossible to imagine if/how a goal this broad would influence daily instruction. Students will increase fluency in ways that support reading comprehension by rehearsing and performing a range of performative texts (poems, plays, speeches) that include repetition and require attention to prosody. Students will read a novel text with accuracy, prosody and a 20% higher rate in words per minute than they did at the beginning of the year. Prosodic phrasing will indicate comprehension, which will be confirmed by paraphrasing or representing what was read in a visual or other modality. This classroom is likely to involve repeated reading for authentic purposes (not skill & drill) and attention to prosody for communicative purposes. Students will write arguments to support claims with clear reasons and relevant evidence, including the acknowledgement of opposing claims, references to credible sources, a concluding statement, and a style that aligns with their chosen purpose and audience. Students will compose, publish and deliver a persuasive piece of writing to the relevant school or town official. It will also earn a score of proficient or advanced on an analytic rubric. This classroom is likely to contextualize persuasive writing within topics that matter to students, and to teach the tools and conventions associated with such writing for the purpose of interpersonal persuasion, not academic correctness. Students select and meet genre-specific expectations by considering their audience and purpose. All of my 11th grade students will compose, deliver and evaluate texts of three distinct types using formats and conventions that match their intended audience. Students will generate and demonstrate a set of criteria for effective compositions in a range of settings. They read widely and consider the impact of various structures and conventions when determining criteria for judging various text types, and will be able to create texts that meet the criteria they have developed. Students are asked to use their writing knowledge strategically and flexibly to understand, deconstruct and compose texts depending on a nuanced understanding of how written language is used and understood across contexts. When setting SLOs and selecting IAGDs, we have to be ready to suggest and explain the goals and measures that support the kind of literacy learning we believe in, in order to avoid narrowing the focus of instruction to whatever is easiest to measure. making explicit connections between the vague aspects of literacy instruction that matter most for students. We have to be ready to make evaluation work for us by linking our goals, conversations and instruction to the aspects of literacy instruction that matter most for students. This means making explicit connections between the vague descriptions on evaluation rubrics and specific literacy practices. It also means setting goals and choosing assessment measures that focus on opportunities to develop powerful literacies – rather than contrived or isolated skills. Allington, R. & Gabriel, R. (2012). Every child, every day. Educational Leadership, 69 (6), 10-15. Applebee, A., Langer, J., Nystrand, M., & Gamoran, A. (2003). Discussion-based approaches to developing understanding: Classroom instruction and student performance in middle and high school English. American Educational Research Journal 40: 3, pp. 685-730. Bond, G. L., & Dykstra, R. (1967). The cooperative research program in first-grade reading instruction. Reading Research Quarterly, 2, 5-142. Calkins, L. (1994) The art of teaching writing. Portsmouth: Heinemann. Cazden, C. (1988). Classroom discourse: The language of teaching and learning. Portsmouth, NH: Heinemann. Dostal, H. & Wolbers, K. (2014). Developing language and writing skills of deaf and hard of hearing students: A simultaneous approach. Literacy Research and Instruction. 53(3), 245-268. Fang, Z., & Coatoam, S. (2013). Disciplinary literacy : What you want to know about it. Journal of Adolescent & Adult Literacy, 56(8), 627-632. Gabriel, R. (2013). Reading’s Nonnegotiables: Elements of effective reading instruction. Lanham, MD: Rowman and Littlefield. Graham, S. & Hebert, M. (2010) Writing to read: Evidence for how writing can improve reading. New York: Carnegie Corporation. Kiuhara, S., Graham, S., Hawken, L. (2009) Teaching writing to high school students: A national survey. Journal of Educational Psychology, 101(1), 136-160. Moje, E. B. (2008). Foregrounding the disciplines in secondary literacy teaching and learning: A call for change. Journal of Adolescent & Adult Literacy, 52(2), 96 107. Nystrand, M. (2006). Research on the role of classroom discourse as it affects reading comprehension. Research in the Teaching of English, 40, 392–412. Shanahan, T., & Shanahan, C. (2008). Teaching disciplinary literacy to adolescents: Rethinking content area literacy. Harvard Educational Review, 78(1), 40- 59. Taylor, B.M., Pressley, M.P., & Pearson, P.D. (2000). Research supported characteristics of teachers and schools that promote reading achievement. Washington, D.C.: National Education Association, Reading Matters Research Report.